It's finally Friday! Everyone is looking forward to the weekend. We are expecting to get snow today and over the weekend, up to 10 inches, more than we have had the entire Winter! 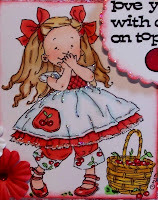 Today's card is for the challenge at Mo's Digital Pencil challenge blog. For challenge # 123, they want us to use lace and a Mo image. I have used Cherry. Oh wow, this funny adorable. Love how the image has been coloured. ooooooo this is really beautiful sue and very sweet. I can't stop staring at Cherry. This is just so adorable, and I love all of the bling you have surrounded her with. Mo's images are just pure perfection. This one takes me to my childhood and the sour pie cherries that grew in my backyard. It was all about the timing so that we got to them before the birds. Oh, and the wonderful pies that were the prize, after the picking!!! Oh my goodness, Sue - this is SOOOOO adorable! As always, your coloring is amazing! Thanks for sharing this beautiful creation with us! verry verry beautiful!! love that image and your stunning colouring! Another beauty. Something special is on it's way to you. Just precious! I love the touches of glitter and that cute sentiment! So glad you joined us in Mo's Challenge. oh Sue you gotta know that I would LOVE this cutie! Super! Sue this is gorgeous, love "Cherry' and what you did with her; the colouring, the background and the embellishments, all just so wonderful! mmmmmm such a yummy card Sue. There is a link on my blog to the image you admired. It is a MelJens. Aren't they darling images? Is this card too adorable or what?!?! Doesn't look like we're getting all that snow, eh? Saturday a.m. looked nasty, but that's about gone here in Tonawanda now. 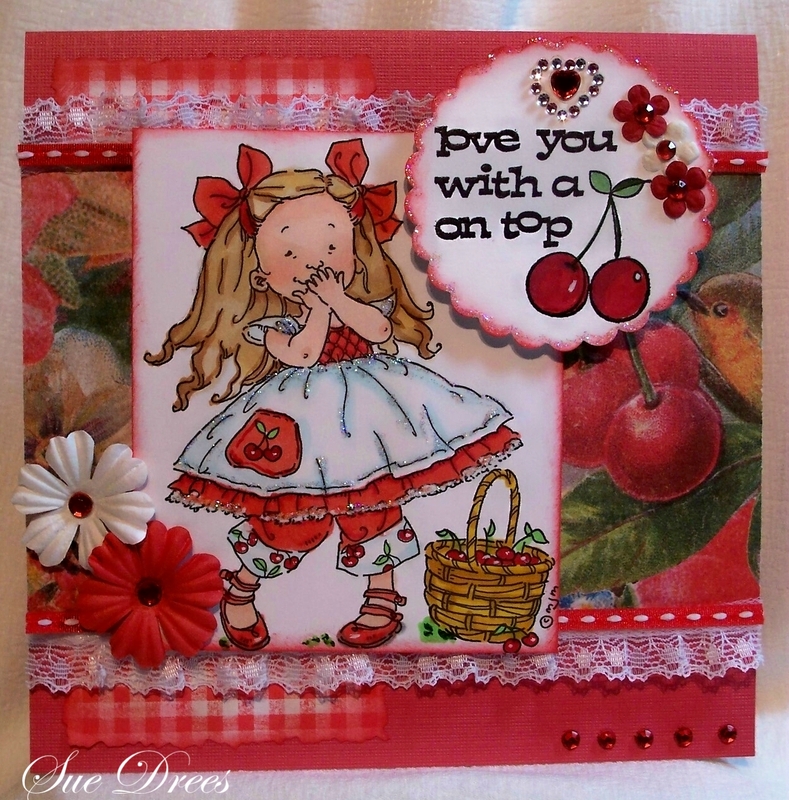 Love the Rich, Vibrant reds and suepr adorable image. 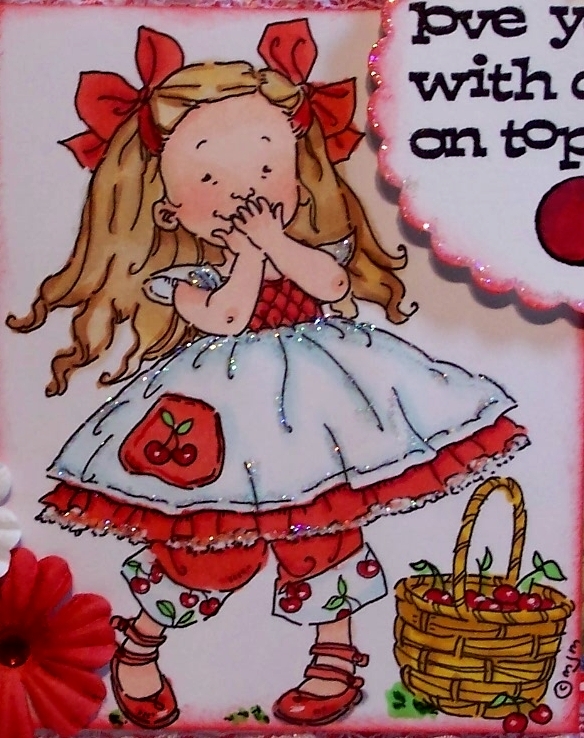 Beautiful combo of embellishments too. Gorgeous work Sue.